The receipts and payments account summarizes receipts and payments made by a non-trading concern during a particular period of time (usually one year). Its is used to prepare income and expenditure account of non-trading concerns. The receipts and payments account is prepared from transactions recorded in cash book and can also be termed as a summarized version of cash book of non-trading concerns. 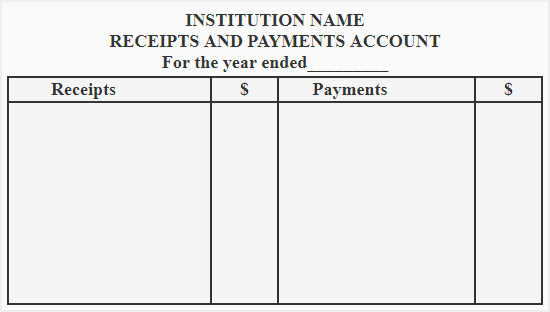 The various cash transactions recorded in cash book that can be grouped together are shown under one account head in receipts and payments account. The receipts and payments account usually starts with a beginning cash and bank balance and ends with an ending cash and bank balance. It records all receipts and payments made by the entity during the period through cash or checks. The double entry bookkeeping system doesn’t apply to this account, it is just a summary of transactions already recorded in cash book. It is prepared on the last day of the accounting year of the non-trading concern. The preparation of receipts and payments account is not necessary however it helps management in pursuance of their various objectives. Cash transactions of both capital and revenue nature are shown in this account. 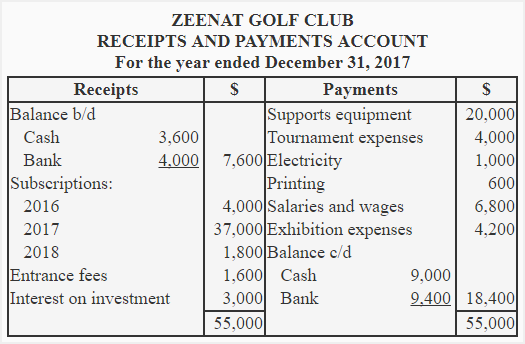 Only cash and bank transactions are shown in this account therefore it doesn’t show all the incomes and expenditures incurred by the entity during the period. It is mainly used for the preparation of income and expenditure account of the entity. Click on the next link below to learn how an income and expenditure account is prepared from a receipt and payment account. write four objectives of preparing a receipts and payment account ?? 1. To ascertain various types of receipts collected in the specific period. 2. To ascertain various types of expenditure incurred in the specific period.